25 E 466 Private, Pillinyer, Smith F 5 Heavy Artl'y, Aug. 26, 1864 Weverton.
" " 537 " Patterson, John I 67 Infantry, Nov. 4, 1862 Died at Hagerstown.
" " 538 " Price, Chauncey K 49 " Nov. 4, 1862 "
" F 589 " Page, James L. H 66 " Oct. 11, 1862 Died at Frederick.
" 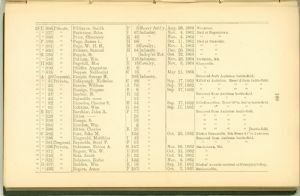 " 601 " Page, W. H. H. M 8 Cavalry, Nov. 1, 1862 "
" " 650 " Prinner, Samuel H 64 Infantry, Dec. 26, 1862 "
" G 739 " Popple, O. Indep'nt Bat. Oct. 12, 1864 "
" " 748 " Putnam, Wm, I 116 Infantry, Nov. 28, 1864 Frederick, Md.
" H 825 " Pagefall, Max E 15 Cavalry, Nov. 3, 1864 Clarysville.
" " 830 " Pfeiffer, Augustus K 8 "
" " 835 " Pepper, Nathaniel C 15 " May 21, 1864 "
" A 28 Corporal, Rimple, George H. 103 Infantry, Removed frorn Antietam battle-field.
" " 31 Private, Rulapaugh, Nicholas C 89 " Sep. 17,1862 Killed at Antietam. Remv'd from battle-field.
" " 33 " Reeves, William A 79 " Sep. 17,1862 "
" " 35 " Rassiga, Eugene B 9 " Sep. 17,1862 "
" " 37 " Raybur, H. H 12 " Removed from Antietam battle-field.
" " 45 " Reynolds,------ 51 " "
" " 92 " Rhoades, Chester S. H 34 " Sep. 17,1862 Killed in action. Remv'd fm Ant'm battle-field.
" " 93 " Rubbins, Wm. G 34 " Sep. 17, 1862 "
" B 117 " Rerchler, John A. F 77 " Removed from Antietam battle-field.
" " 129 " Ritter,------ 20 " "
" " 150 " Rosegu, S. 59 " "
" " 185 " Riordon, Wm. 2 " "
" " 199 " Ritter, Charles B 20 " "
" C 292 " Rust, John M, 122 " Oct. 26, 1862 Died at Downsville, Md. Remv'd f'm Antietam battle-field.
" " 296 " Ringwald, Matthias I 42 " Removed from Antietam battle-field.
" " 301 Corporal, Reynolds, Stoel F. F 51 " "
" " 303 Private, Robinson, Nelson A. G 107 " Nov. 16, 1862 Smoketown, Md.
" " 311 " Rogers, Wm. W. E 105 " Oct. 11, 1862 "
" " 316 " Ross, Jacob E 22 " Oct. 14, 1862 "
" " 321 " Robinson, Rufus I 122 " Nov. 6, 1862 "
" D 407 " Rodden, Wm. K 16 " Sep. 16, 1862 Died of wounds received at Crampton's Gap.
" " 433 " Rogers, Amos F 107 " Oct. 7, 1862 Burkettsville.